On October 20, a charter bus departed the Mission and Resource Center in Neptune with 36 GNJ laity and clergy en route to the ‘All People Conference’ at the United Methodist Church of All People in the south side of Ohio’s capital. Bishop John Schol browsed his notes on his iPad as an ocean of trees swooshed by in a blurred landscape as the rolling timpani of the engine and the horn section of murmuring passengers vibrated in a symphony of transportation. Schol would be joining Rev. Junius B. Dotson, General Secretary of Discipleship Ministries and Rev. Olu Brown, the Lead Pastor of Impact Church, as one of the conference’s keynotes. Several years ago Schol was asked to speak at the conference by the All People Church’s Pastor, Rev. John Edgar. He agreed under the condition that he would be able to bring others with him so they could witness firsthand the transformative potential of community building and living out what it means to be a church for all people. Edgar agreed, and Schol packed a charter bus in what would become GNJ’s first group road trip. The bus hurried across the Route 70 bridge in the West Virginia town of Wheeling; a small sliver of the state that stretches in-between Ohio and Pennsylvania. Red, yellow, and orange autumn speckled across the Appalachian foothills surrounding the rustic town, and the ride out to Columbus seemed relatively quick. But it would be the spiritually charged conversations on the drive back after a powerful weekend conference that left lasting impacts. Caldwell-Gross described the discernment and questions discussed over lunch, rest stops and on the bus as “Holy conversations.” She likened the relationships fostered on the bus to GNJ PaCE Groups. Sean, the bus driver, became friends with many of his passengers. He remembered names, engaged the group, made specific accommodations, and cracked jokes. He briefly shared his testimony of how he found faith in Christ. For Rev. Brandon Cho of Morristown UMC, the road trip experience with other GNJ colleagues was enriching. “We shared our experiences, insights and learning application possibilities,” he said. Rev. Michael Reed of Pearson Memorial UMC in Hamilton said the retreat experience catalyzed conversations and projects that would have otherwise taken months to achieve. “If they would have happened at all,” he said. 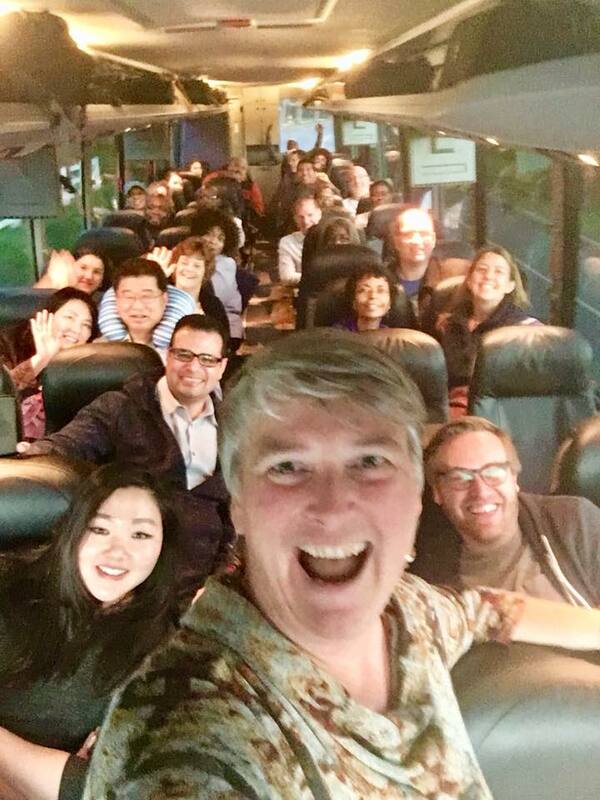 Constrained to a bus for ten hours also provided ample time for networking and making connections. Story leads were discovered and bright spots shared as laity and clergy spoke about their ministries, churches, and initiatives. New concepts were sparked and possibilities entertained as conversation topics continued linking and new ideas were birthed. In the early hours of Tuesday morning, October 24, the bus rolled into the parking lot of the Mission and Resource Center. The 36 passengers left with new friendships, deeper relationships, a rich, memorable experience, and a vast pallet of possibilities.